When paleontologists Paul Sereno and Jeff Wilson arrived in India in 2001 to study a mixed collection of dinosaur bones gathered by Indian scientists 18 years earlier, they found the bones spread out on an office floor. Sifting through the collection, they separated out the bones of a theropod, or meat-eating dinosaur. When they found the center part of a skull, they recognized a horn resembling those of dinosaurs found in Madagascar. Their search continued, yielding a left hip, then a right hip, then a sacrum. Sereno and Wilson consulted detailed, hand-drawn maps drafted by their Indian counterparts and discovered the bones had been buried next to each other, as if they had been connected. "There was a Eureka! moment when we realized we had a partial skeleton of an undiscovered species" said Sereno, a paleontology professor at the University of Chicago and a National Geographic Explorer-in-Residence. The bones were collected in 1983 by Suresh Srivastava of the Geological Survey of India (GSI) and Ashok Sahni, a paleontologist at Panjab University, during a search for dinosaur eggs and nests. Srivastava drew a detailed map to document the position of the fossil bones as they lay in the field. The scientists then stored the 65-million-year-old bones at a GSI office, where they stayed until Sereno and Wilson arrived. Working with Indian experts, Wilson and Sereno reconstructed the skull of the new species, a stocky, 30-foot-long (9-meter-long) carnivore named Rajasaurus narmadensis, which means "regal dinosaur from the Narmada," the river region in western India where the bones were found. The project was supported in part by the National Geographic Society. 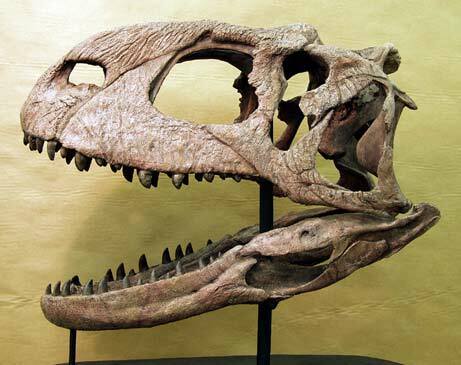 "We knew of fragments and bones [in India]," said Sereno, who has discovered new dinosaur species on five continents. "But this skull reconstruction offers the first glimpse into the lost world of the Indian dinosaur." There were already two Jurassic dinosaur skeletons mounted in India. Neither, however, represents a single skeleton, but is instead based on composites of isolated bones. "We know that there were carnivorous and herbivorous dinosaurs in India through individual bones, but we really don't know just how they looked because no two bones can be reliably said to belong to one individual," said Wilson, who is of the University of Michigan. "Rajasaurus is important because it represents a partial skeleton and preserves many details that clue us into its evolutionary relationships." The reconstructed skull is missing some parts, but it has the most important pieces: the jaws and the brain case. 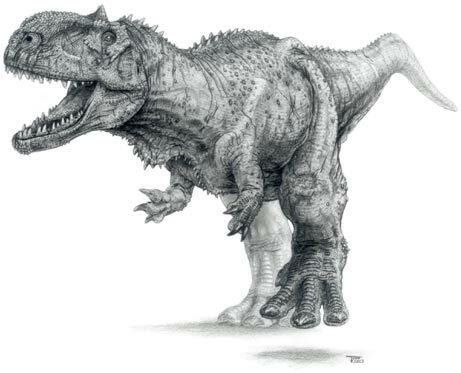 Between 25 and 30 feet (7.6 and 9 meters) long, the Rajasaurus was heavy and strong, and walked on two legs. "There are several anatomical details that make Rajasaurus a new species," said Wilson. "Perhaps the most striking is the horn it bears on its head. The horn was probably rather subtle. It may have been low and rounded." The carnivorous Rajasaurus, which lived in the Cretaceous Period at the end of the dinosaur age, preyed on long-necked titanosaur sauropods, herbivorous dinosaurs that also roamed the Narmada region. Bones from both dinosaurs were found together. "Large theropod eggs have also been described by our group from the area where the skeleton of Rajasaurus has been recovered, but it's difficult to relate the theropod eggs specifically to Rajasaurus," said Sahni. The scientists believe the Rajasaurus is related to a family of large carnivorous dinosaurs, most of which had horns, that roamed the southern hemisphere land masses of present Madagascar, Africa, and South America.